Fungicide planning is critically important to maximising returns from the wheat crop. Our courses are designed to help you understand fungicide strategies and adjust your fungicide inputs for maximum profitability. 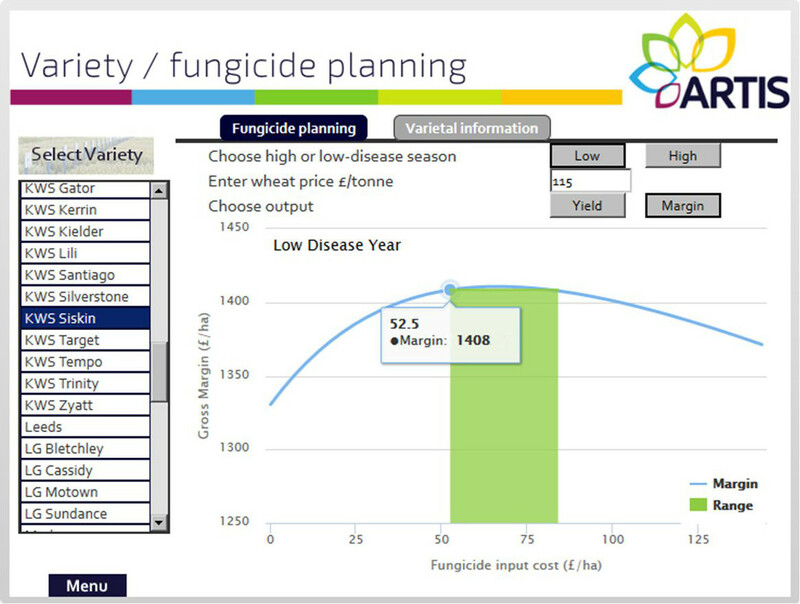 NIAB TAG’s Technical Director, Bill Clark, has developed a series of courses for ARTIS featuring a unique variety/fungicide planning tool, which shows how varieties respond to fungicide inputs and gives guidance on where the economic optimum for fungicide inputs lies. The courses challenge common assumptions around fungicide timing and crop growth stages whilst providing the most recent information and advice on fungicide resistance issues, new yellow rust races and the future impact of legislation. The example below of the tool shows how typically, on less responsive varieties, savings of up to £50/ha can be made in low disease years. Even on disease-prone varieties, savings of up to £40/ha can be made in low disease years.